The Yealink SIP-T27G is affordable enough to be practical, and powerful enough to be the best phone you’ve ever used. Expansive features, HD Audio, and upgraded network security make the T27G a top choice among professionals. The T27G offers upgrades to its predecessor, the T23G. The user interface responds faster, has better voice capabilities, and has more programmable functionality. Not only does the SIP T27G have more features, it includes an auxiliary USB port, and allows users to expand functionality with Bluetooth, Wi-Fi, and USB dongles. The T27G also features Yealink’s Optima HD Audio, with Yealink’s high performing software and hardware for the optimal sound quality during your phone calls. 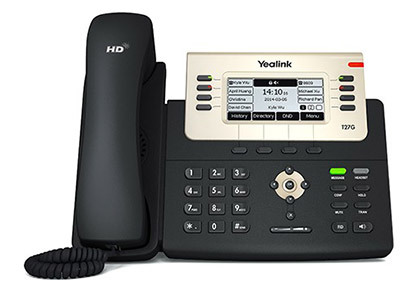 The hardware incorporated in the SIP-T27G combined with the Yealink Optima Audio technology included in its software provides the best sound quality available to VoIP phone systems. The all-new USB port on the SIP T27G empowers your functionality more than ever before. Use Bluetooth, Wi-Fi, and USB recording features with ease.